Italy Needs EU Bonds And It Needs Them Now! You see, this isn’t a brainstorming session — it’s a collision of fundamentally incompatible world views. As a wise man recently said, failure to act effectively risks turning this slump into a catastrophe. Yet there’s a sense, watching the process so far, of low energy. What’s going on? First, focus all attention on reversing the collapse in demand now, rather than on the global architecture. Second, employ overwhelming force. The time for “shock and awe” in economic policymaking is now. OK, I think no regular reader of this blog could seriously suggest I have much sympathy for the sort of views you normally find being propagated by Italy's Finance Minister Guilio Tremonti, but when he starts to send out the kind of red warning light danger signals that he has been doing over recent days, then I think we should all be taking note, and when the republic is in danger, then its all hands to the pumps, regardless of who is sounding the alert. This is not a brainstorming session, it is a real flesh and blood crisis. Italy's Finance Minister Giulio Tremonti has said he favoured the issuance of government debt by the European Union. "Now my feeling -- I am speaking of a political issue not an economic issue -- is ... now we need a union bond," Tremonti said at the World Economic Forum in Davos. Countries in the euro zone currently issue sovereign debt in their own name, rather than regionally. Bond traders concerned about the mounting public debt of Italy, Greece and Ireland have pushed down the value of their government bonds, sparking speculation they might be driven out of the euro zone. Now why would he be arguing this? Well the state of Italy's own banking sector would be one part of the explanation, and the fact that the Italian government is in no position to mount a rescue operation on its own given the size of its existing debt to GDP commitment, would be another. In particular, and as I have been arguing, Unicredit - and its Eastern Europe exposure - is a huge worry. Indeed the situation is now so delicate, that according to this Reuters report last week, Unicredit really doesn't know which government to turn to. The Italian one perhaps, or the Polish one, or "it could consider doing it in Austria". Italian bank UniCredit is considering requesting state support in Italy and Poland, a source close to the bank told Reuters on Thursday. "The bank does not exclude possible state support in Italy and Poland," the source said on condition of anonymity. In an extract of an interview to be published in Germany's Handelsblatt newspaper on Friday, UniCredit Chief Executive Alessandro Profumo said the bank could consider "state support as insurance against unpredictable events." If the bank does seek state aid, it could consider doing it in Austria, for example, he added. UniCredit SpA is considering asking for government capital amid the credit crunch, Chief Executive Officer Alessandro Profumo said. “State support as insurance for unforeseeable events” is conceivable, Profumo told Handelsblatt newspaper in an interview at the World Economic Forum in Davos, Switzerland. A UniCredit official confirmed the comments to Bloomberg. Italy’s top bankers met with central bank Governor Mario Draghi last week to discuss the financial crisis, which has caused bankruptcies and government bailouts across the world, while stocks have plunged and credit markets have seized up. UniCredit and some of its rivals have tumbled in Milan since the start of 2008 amid concern about the strength of their finances. The shares were offered at 3.083 euros apiece, or over twice what they were trading for in Milan at the time (around 1.408 euros). Shareholders, including Allianz SE and the Central Bank of Libya, are among those who agreed to buy the convertible bonds, according to the bank offer document. Shares of UniCredit have dropped 54 percent since October, when the rights offering was announced, amid concern the capital raising won’t be sufficient. But even the bonds issue is running into trouble, since Il Sole 24 Ore reported that Unicredit may raise only 2.5 billion euros rather than the full 3 billion euros because because investor Fondazione CariVerona, which holds a 5 percent stake in the bank, reportedly hasn’t received approval from the government to buy the securities, however, the reason they have not received approval may well be that they have not yet applied since the Italian Treasury, in what is a rather unusual step, said on Thursday announced that they had yet to receive a request from CariVerona to sign up for the bond issue. All this suggests, of course, that Tremonti's warning about an imminent bailout could be a piece of brinksmanship, designed to presssure CariVerona to stop playing "positioning" games and come up with the money, but irrespective of whether or not this is the case, some sort of rescue operation for Unicredit surely cannot be far away at this point. And the fact that Bulgaria's Finance Minister Plamen Oresharski was running around last week assuring everyone that Bulgaria's banks have not asked for state rescue aid so far, and that the government is not worried about the banking system's health for now, is hardly helping to calm already troubled nerves. About 80 percent of the 29 commercial banks operating in Bulgaria are foreign-owned, with the biggest lenders being run by Italy's UniCredit, Hungary's OTP Bank, Greece's National Bank of Greece and Austria's Raiffeisen. And only today Tremonti has warned that the announcement of more EU bank bailouts is imminent, and maybe as early as this weekend. European governments may have to bail out more banks as soon as “this weekend,” Italian Finance Minister Giulio Tremonti said today. “So far in Europe there have been more than 30 bank bailouts and I can’t rule out that there will be more this week- end,” Tremonti said, speaking at a press conference after today’s Cabinet meeting in Rome. b) The introduction of quantitative easing by the ECB (quantitative easing is the monetary policy which is currently being applied in both the US and Japan, and probably soon in the UK too). c) Letting those members of the East who want to join the eurozone immediately do so. d) A new "pact" - one which would be much, much stronger than the old Stability and Growth Pact - to be signed by all countries who enter the EU bond system, a pact which gives direct fiscal remedies to Brussels in the event of non-compliance together with a substantial dose of effective control over the economies of individual countries - since nothing, Mr Sr. Tremonti, ever comes completely for free. Obviously all of this is quite radical, and indeed fraught with danger, but these are hardly normal times. In all of this (d) is obviously the most important part, as any protection given to EU member economies by the Union must be credible and serious. So no country could or should be forced in, but it should also be pointed out to those who chose sovereignty and remaining on the fringes to participation that they would run an enormous risk. Since almost all EU economies seem vulnerable at this point, anyone staying outside could rapidly see themselves exposed to the risk of forced default, since lack of protection is simply an invitation to attack. Letting ourselves get picked off one by one is not an appetising prospect (Latvia, Hungary, Greece, Austria, Italy, Spain, Ireland, the UK, Romania, Bulgaria.........). Clearly those who wish to remain "dissenters" should have the liberty to do so, but they should bear well in mind that should they do so they could very easily end up in a group - possibly lead by Diego Armando Maradona - together with Yulia Timoshenko (Ukraine), Cristina Fernadez (Argentina), Rafael Correa (Ecuador) and (possibly) whoever is the new prime minister in Iceland, bankrupt, and without the aid of international financial support to help deal with their mess. Perhaps readers may think I am being rather shrill here, and perhaps at this point Tremonti (for whom I have no afinity, elective or otherwise, see linked post above) is only playing brinksmanship, but if he isn't, and Unicredit is about to need bailing out, then push does quickly come to shove, since the EU leaders agreed on October 12 in Paris to bail out systemic banks, and Unicredit is a systemic bank. So will will need to know how they plan to stand by their commitment, and if they don't, well then everyone of us stands exposed, since credibility rapidly falls towards zero. Maybe this is a false alarm situation, and Unicredit will not need bailing out this weekend, or the next one, but one day it will, and one day Spain's huge non performing loan and household debt default problem is going to need sorting out. So I think this is a line in the sand situation, and we are much nearer to having to make up our minds which side of the line we are on than many seem think. To paraphrase Paul Krugman again, in flirting with the idea of whether the first to default should be Greece, or Hungary, we truly are flirting with disaster. Russia's current woes can be readily summed up in just one single variable - the value of the ruble - and this value, as we all know, is falling. Almost uncontrollably so. First Deputy Prime Minister Igor Shuvalov expressed regret that the general population failed to fully understand the Central Bank’s policy on the ruble’s exchange rate against the dollar/euro basket. The government did let the ruble depreciate, but it did so gradually, providing plenty of time for people to decide which currency to keep their savings in. In fact the ruble fell sharply again last Friday, and was on the brink of breaching the target trading band, yet one more time, following its biggest monthly depreciation in more than a decade. The ruble was down at one point by as much as 1.4 percent on the day (to 35.59 per dollar), 1.1 percent away from breaking the 36 per dollar limit. The Russian central bank has now expanded its trading range 20 times since mid-November in a series of attempts to defend the currency. These continuing attempts to hold a line have lead the central bank to use up more than a third of its foreign-currency reserves since last August, a period in which the ruble has fallen some 34 percent slide against the dollar. The ruble has now depreciated by 20 percent since the start of the year - making January already the worst month for the currency since 1998. And there is obviously more to come, with the government now expecting a decline to 36 per dollar following the latest widening in the trading band, according to First Deputy Prime Minister Igor Shuvalov speaking in the State Duma last week. This "managed devaluation" is seen as an attempt to avoid a reapeat of what happened back in 1998, when the ruble fell by as much as 29 percent in a single day. Yet the currency has now lost over 30% against the dollar (and weakened substantially against the euro) since last summer and all this spells disaster for domestic banks and industrial companies, whose debt is denominated in dollars and euros but who depended on rouble-denominated revenues. One of the principal problems facing those banks and companies who have this mismatch if that they have insufficient foreign exchange liquidity, while other parts of the banking and corporate sector are better positioned. That is the aggregate external position understates the extent of the problem, since the lack of internal confidence makes it hard for those who are under severe stress to find the appropriate lenders. In part as a an attempt at a solution to this problem state owned investment bank Vnesheconombank (VEB) is preparing to issue foreign-currency bonds to be placed among Russian banks with excess of foreign currency and then redistribute the currency raised to those in need of foreign currency liquidity. During the last quarter of 2008 the net increase in foreign currency assets in the corporate sector was over $100 bln. According to the central bank external corporate debt redemptions totaling $120 bln are anticpated during 2009, which indicates a shortfall of only $20 billion, yet according to Interfax the total volume of applications for fx support to VEB from Russian companies is $80 bln. Which suggests that a sizeable chunk of the $100 bln accumulated by Russian corporates at the end of last year was not intended for foreign-currency debt redemptions but was instead a means a protecting free liquidity from falling in value. That is they converted their liquidity into USD and Euro to avoid losses (or make gains) from the devaluation. The root of Russia's most recent problems is very evidently all that excess inflation which Russia has seen over the last 18 months (if it hadn't been for the inflation there would have been no devaluation, and hence no issue with forex loans), inflation which has taken badly needed competitiveness from Russia's manufacturing industry at a time when the oil and commodity sectors are in the grips of a severe price slump (which means their contribution to the economy is greatly reduced). Obviously Russia's situation doesn't make for any easy answers, and even devaluation brings with it the problem of the attendant inflationary uptick from imported goods. 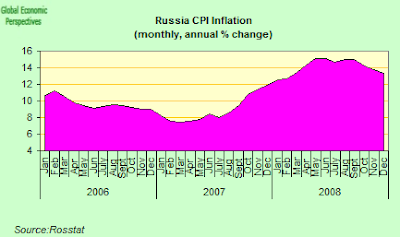 Russia's month on month inflation is expected to reach 2.4 percent in January 2009, according to the latest estimates from the Russian Federal State Statistics Service (Rosstat), and the Economy Ministry currently estimates Russia's whole year inflation could be as high as 13 percent in 2009. In fact the annual rate for last December was 13.3% (see chart below), so they seem to anticipate very little change in the situation. In fact they may be unduly pessimistic here, since they are almost certainly underestimating the force of Russia's current economic contraction, and the collapse in internal demand may well bring Russia's inflation down more rapidly than they are expecting. Basically the Russian economy is currently suffering the effects of a long term policy of trying to control the currency value at the same time as being "soft" on inflation. This approach evidently hasn't worked out, and it is to be hoped that some lessons for the future may have been learned, but the sorry reality is that those currently responsible for managing Russia's economy are left with only hard policy options at this point, if they wish to avoid another default. Basically, and on top of all the rest, the economy has two added problems (apart, that is, from the drop in oil prices, the internal credit crunch and the slump in domestic demand): the high inflation, and the capital exit. Russia's reserves are disappearing for a whole variety of reasons at this point. First there are foreign investors who are simply pulling out - investors have removed about $290 billion from Russia sincethe start of August, according to the latest estimates from BNP Paribas. Secondly the Russia central bank has been using reserves to defend the currency. According to the Central Bank last week, Russia's foreign exchange and gold reserves dropped by nearly $10 billion from $396.2bn to $386.5bn in the week to 23 January.Citigroup calculate that the bulk of that fall was the by-product of a strong negative revaluation effect - which may have exceeded $8 billion - and the strengthening of USD vs EUR and GBP probably subtracted $5.5bn and $3.7bn, respectively, from the total in USD. 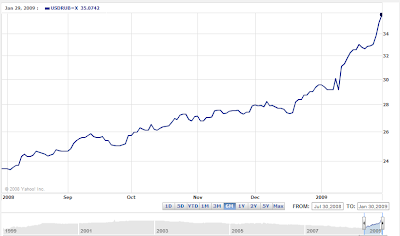 Nonetheless Russia has spent very large quantities of foreign exchange on supporting the ruble since August . According to Kommerant reports Bank Rossii told Russian bankers in a meeting in the middle of the month that their “managed devaluation” of the ruble was over, but as we can see, this is far from being the case. Nikolai Kashcheev, head of economic research at Moscow-based MDM bank, Russia may abandon the ruble's dollar-euro trading band completely and allow the currency to trade freely, with the central bank only intervening to avert serious economic shocks using a so-called “dirty float” mechanism. The central bank sold $3.2 billion last Friday alone, and $800 million Thursday, according to MDM Bank estimates. The bank appears to have stayed out of the market between January 23 and 27, the first three days after widening its exchange-rate band. Other demands on foreign exchange comes from Russian corporates who need to pay off foreign exchange debt, or simply protect their ruble liquidity from the devaluation fall, and from individuals and households who wish to do the same. As a result of the reserve and inflation pressures Russia’s central bank has little alternative but to maintain a relatively tight monetary stance, and indeed the bank raised two key interest rates for the third time since the start of November last week, with the repo rate for one-day and seven-day loans being raised to 11 from 10 percent. Now I say "relatively tight", since obviously with CPI inflation currently running at over 13%, even 11% interest rates are negative in Russia (by around 2%), and thus Russian policy rates could be considered somewhat accommodative (though not as accommodative as would be desireable given the strength of the hit the economy just took). At the end of the day terms like "tight" and "accomodative" are relative terms, and it all depends what you are dealing with. The Central Bank does not rule out the possibility of a new wave of the crisis erupting in the banking sector, the bank's Chairman Sergei Ignatyev told the Russian State Duma on Friday. He noted that although such a risk was unlikely in the near term, it was still fairly possible in the foreseeable future. The new wave of crisis may be brought about by a rise in loan defaults, Ignatyev explained. The Central Bank is holding meetings with bankers and keeping a watchful eye on the situation, the official said, adding that the bank was ready for any new developments. He also noted that an increase in certain banks' capitalization might prove necessary. Russian media are also reporting that the government anti-crisis committee (which is headed by Deputy Prime Minister Shuvalov) is putting together a rescue plan for carmaker OAO GAZ. If confirmed the move that would mark the first custom built financial rescue of an individual company by the government during the current economic crisis. OAO GAZ, which is based in Nizhny Novgorod, may need $1.6 billion in state funds to continue operating. Shuvalov has confirmed that the government plans to offer substantial support to Russian companies. “The list of such companies will be expanded to 2,000,” he said, noting that it would include both companies involved in the technical modernization of the national economy and those in a difficult financial situation. “To save all companies is impossible and unnecessary". Another company in difficulties is United Co. Rusal, who are set to sell shares in a private placement as they seek to refinance about $16.3 billion of debt, according to billionaire shareholder and company Chairman Viktor Vekselberg speaking in Davos. The Russian company owes $7 billion to foreign banks, about $6.5 billion to domestic lenders and about $2.8 billion to Mikhail Prokhorov’s Onexim Group. Rusal is in “active” talks with creditors. Rusal, which is Russia’s largest aluminum company, will cut output by as much as 10 percent and freeze investment for about three years. Aluminium fell to a five- year low this month, and profit is projected to slump 88 percent to $476 million this year, according to an estimate by ING Groep NV. Aluminum needs to trade at $1,700 a metric ton for Rusal to be able to service its debt and pursue new projects, according to Vekselberg - aluminum for delivery three months forward was 1.2 percent lower at $1,350 a ton as of 12:18 p.m. on Friday on the London Metal Exchange. Rusal was forced to seek a $4.5 billion bailout from state-owned Vnesheconombank in October to refinance loans used to buy 25 percent of OAO Norilsk Nickel, Russia’s biggest metals and mining company. So far Russia’s indebted companies have been bailed out by the government, but this year they are due to repay an additional US$117bn to foreign creditors. With opportunities to roll over existing debt limited, and the government’s reserves down by US$200bn since August, the chances of continuing rescues by the federal authorities appear greatly reduced. According to the latest central bank data, some US$117bn of debt needs to be repaid this year, with US$52bn owed by banks and US$62bn by corporations. Debt restructuring looms on the horizon. Evidently the crunch in the financial economy - Russia's base money shrank dramatically (from 4283 bln rub to 3896 bln rub, that's not far short of 10% in a month) between 29 December and 26 January - is having a serious impact on the real economy, and nowhere is that clearer than in the unemployment numbers. As could have been expected Russia’s unemployment rate rose sharply in December (up to 7.7 percent from 6.6 percent in November), its highest level since November 2005, as industrial production shrank the most in ten years. The total number of unemployed reached 5.8 million people, as compared with 5 million in November. What is most notable is the sharpness of this rise. Alongside the rise in umployment wages have started to fall, and the average monthly wage fell an annual 4.6 percent in December to 17,112 rubles ($517.85), the first contraction since October 1999 when they fell 2.2 percent. Real disposable income fell 11.6 percent, the biggest contraction since August 1999, according to Rostat. So this is how one part of the mechanism works basically. The oil price drops, the ruble devalues, fx loans become unsustainable, new funding dries up, and then the real economy sinks like a stone, and as the unemployment goes up, household and investment demand go down, and economic activity heads on a downward spiral. If we now turn to economic forecasts for 2009, Economy Minister Alexei Kudrin said last week that Russia's 2009 GDP growth would be close to zero - a figure which was revised down from the Economy Ministry's earlier 2 percent estimate. “We must be prepared for further economic decline and a conservative tax and budget policy. Yet we will implement our main programs involving the social protection of the population. The reserves we have built up allow us to be up to that task,” Kudrin stressed. Russia's Reserve Fund now stands at 4.7 trillion rubles ($142.5 billion) and the National Wealth Fund at 2.6 trillion rubles ($79 billion). On February 1 2008 the Finance Ministry divided the former Stabilization Fund into the Reserve Fund, which is intended to cushion the federal budget from a plunge in oil prices, and the National Wealth Fund, designed to help Russia carry out pension reforms. First Deputy Prime Minister Igor Shuvalov stated that the global financial crisis is expected to last three years, He confirmed the appropriateness of the government’s reserve strategy, noting that the Finance Ministry was under pressure to start using the reserves several months ago. 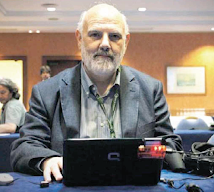 The crisis could be even more severe than was originally thought, he warned. “We are considering a scenario which is already tough enough, but it could get even tougher, with federal and regional budget revenues falling more sharply than we are estimating,” Shuvalov explained. 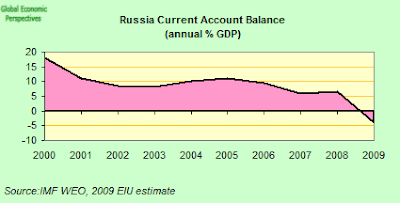 Unless the oil price recovers soon, Russia's current-account surplus will turn into deficit during 2009 (the Economist Intelligence Unit forecasts that it will equal 4% of GDP), meaning that the country would be forced to subsidise vital imports, including food, out of its already strained dollar holdings. Even if an outright default is likely to be avoided, some debt restructuring moves involving the bulk of Russian debt now seem more or less unavoidable. 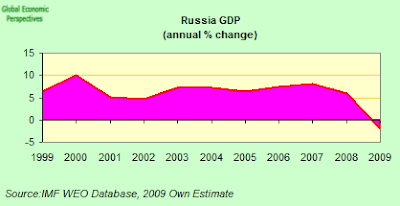 As for the outlook for Russian GDP, Kudrin's forecast seems somewhat on the optimistic side, and it is interesting to note that Citgroup have now revised to a 3% contraction in 2009 followed by growth of 1.7% in 2010. They argue (and I agree) that the key change in 2009 GDP is likely to come on the domestic consumption side. Private consumption, which accounts for about 80% of total consumption, now looks set to contract significantly (Citigroup forecast 4.6%), even if the government keeps its originally planned level of current spending. At the same time investment will also contract (Citigroup suggest by 10%) owing to reduced access to credit and further possible cuts in government capital spending (which accounts for about 10% of total investment growth). The government capital injections (an additional US$40 billion, according to Finance Minister Kudrin, Bloomberg, 22 January) is more liekly to go towards covering bank non performing loan losses rather than supporting new credit. Even more worryingly Citigroup forecast a 10% contraction in new credit. Furthermore, they argue that the government may well have to cut capital spending owing to the need to accommodate increases in social spending and support for the regional governments. As a result of falling income and investment spending imports will fall (perhaps by 20% in dollar terms), this will be positive for the current account deficit (and to some extent for GDP. A 3% CA defeicit thus seems reasonable assuming no rebound in oil prices. So, not a rosy picture. Next stop some more real economy data next week, and the manufacturing and services PMIs.